Pre-owned Hublot King Power Unico Automatic Chronograph 18ct Rose Gold 701.OQ.0180.RX(Hublot Serviced 2019) in exceptional condition. 48mm 18ct Rose Gold case. Skeleton dial with Rose Gold luminous hands and index hour markers. Minute markers around the outer rim. Date display positioned between 4 and 5 o'clock. Two Chronograph - sub-dials displaying: 60 second and 60 minute. Automatic movement with a 70 power reserve. Scratch resistant sapphire crystal. Screw down crown. Skeleton case back. Black rubber strap with a Deployment clasp. Water resistant at 100 meters / 330 feet. U.K Box and Hublot Warranty Papers dated September 2016. 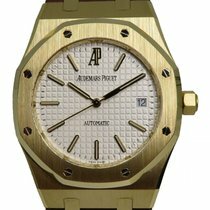 This watch has received a service and valet prior to listing at Hublot U.K and is in exceptional condition and includes a copy of the invoice for £430. The pictures you see are pictures of the actual watch (with exception of the front cover shot) !! We sell only what we have IN STOCK!